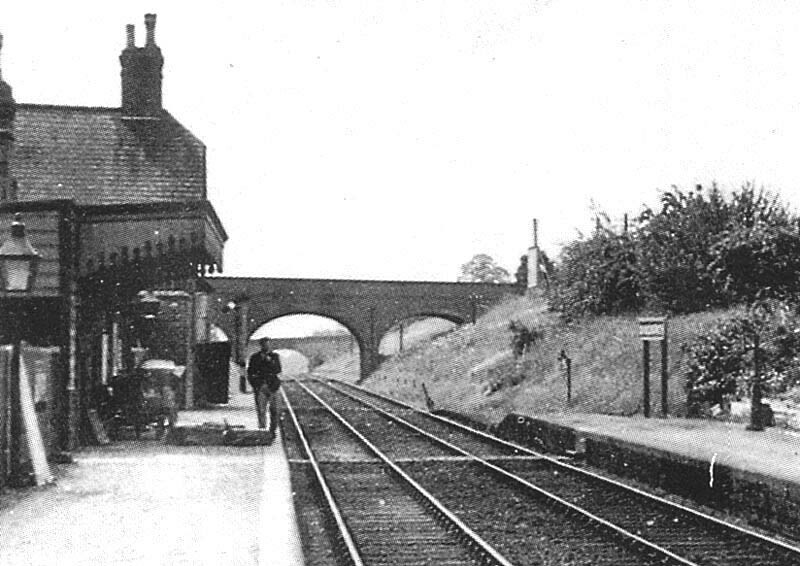 Close up of image 'lnwrdun1337' showing Dunchurch station's separate timber built waiting room, the station master's house and shorter up platform on the left. The platform appears to have a porters luggage trolley with parcels on top and to the front. The canopy of the waiting room has been as a continuation of the roof line sloping backwards to prevent water falling on passengers. The up platform is shorter than the down and has a path raised slightly above the rail leading to a boarded barrow crossing to be used by passengers to gain access to and from the down platform. The boarded crossing in the foreground - opposite the station building - would be used by station staff only gaining access to the up platform via the step built in to the face of the platform.